I try to highlight the history of Battle Creek, Michigan, my home for the past 25 years, at least once a month. This month I have chosen the Willard name, which one will see if they visit Battle Creek. Charles Willard came to the Battle Creek area in 1836. His legacy is still felt today in Battle Creek, Michigan. The Willard name can be found around town in two places. One, Willard Library which is located in downtown Battle Creek. This two story library is an asset to the community. I use it frequently. There is a branch of Willard Library, Helen Warner Branch, where the local history section can be found. The second is Willard Beach on Goguac Lake. 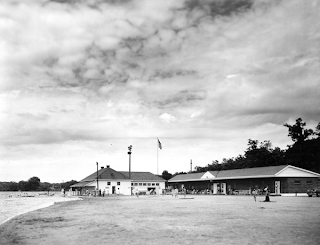 The land that Willard Beach is on was originally the home of Charles Willard. He willed this land to the city to be used by the public for recreation. Willard Beach isn't too far from my home. I am embarrassed to say I don't use it very much. 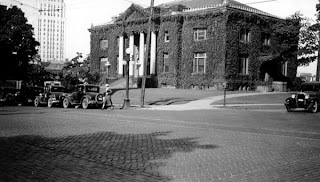 To see more historic pictures of Battle Creek, check the historical images section at Willard Library. Brenda, I enjoyed reading about the Willard name, although I'm a bit familiar with the library. Good series idea of highlighting your town. I just wish my several ancestors made a mark on the city! Barbara, your relatives made a mark, just not one that made the papers or that put their name on a building.